Every other Tokusatsu is only second best. Which one is the best? You’re looking at it. Are you surprised? We secretly worked on this show in between Megaranger episodes. Presented here are 17 episodes (aka half) of the legendary show known simply as The Magnificent Zubat. Zubat is the story of Hayakawa Ken, a private detective, who sees his best friend shot dead in front of him. Now he’s out to find the killer, and get revenge for his friend’s murder. He does this by completing his friend’s research project, the Zubat Suit! Using this suit Ken gains super strength, and as Zubat he makes sure evil pays (I just spoiled the opening song for you, sorry!). This sounds pretty dark, but don’t worry! Zubat has plenty of lighthearted wackiness to go along with it’s more dark, and sinister moments. You’re going to laugh, and then gasp at every episode, without fail. At times it’s like Adam West Batman, and other times it’s the Dark Knight. It’s a wonderful fusion, and every episode is masterfully crafted. To add to the awesomeness, the opening and ending songs are sung by the legendary Ichiro Mizuki who injects his signature style into every verse. Ken himself is portrayed by Hiroshi Miyauchi who might be best known as Big One in JAKQ Dengekitai, and Kamen Rider V3 from… Kamen Rider V3. He was also AoRanger in Himitsu Sentai Goranger, and Chief Miura in Chouriki Sentai Ohranger. Oh, and did I mention that this show was created by the legendary Shotaro Ishinomori, one of the most renown manga artists ever? He even has a cameo! This sounds too perfect, doesn’t it? There gotta be a downside to this show, right? No. In my own biased opinion, Zubat lives up to his claim of being #1. I hope you enjoy this tragic story about a wandering hero and his quest for revenge. Zu-BAT! Special thanks to Hikari-Senshi for timing episodes 1-10. This project has been a goal of mine for quite some time. It all started one boring summer day in 2011. I was watching episode 7 of Megaranger, and I was getting quite frustrated at the quality of the subtitles. The breaking point came when the monster of the week was subtitled as HachiNejire with a little sign at the top of the screen telling me that Hachi was Japanese for Bee. It was then that I desperately hoped someone would fix up the subtitles for Megaranger, and a few moments later I decided to do it myself. A little over a year and a half later I had scrubbed 23 episodes of Megaranger. Along the way I learned a lot about subtitling, and the Sentai fandom as a whole. Because of Megaranger I’ve gotten to do a lot of really fun things, and talk to a lot of great people. So you can probably imagine that this is a very special show to me. Zyuranger might have been the first Sentai I ever saw, but Megaranger holds the honor of being the first show I ever subbed. It means just as much to me as Zyuranger does, and I hold it very close to my heart. I’ve come along way since that boring summer afternoon, and it’s all thanks to this show. But you guys don’t care about that, you wanna hear all about Megaranger! In 1997 Denji Sentai Megaranger aired as the 21st entry in the Super Sentai Series. It was about 5 high school students who turn into characters from a popular arcade game. They fought against the twisted Nezirezia using their new powers, all while juggling school life, and being superheroes. It was an interesting premise, and the high school thing hadn’t been done since Turboranger in 1989. But Megaranger has this spark that sets it apart from other Super Sentai. There’s something about it that makes it really unique and enjoyable. I can’t really say what it is myself, but I hope you all enjoy this show, and find that spark for yourself. You’re gonna laugh, cry, and laugh again. Megaranger is just that good. Compared to my older work not a lot of terms and names have changed. If they have it’s simply the spelling. The biggest changes to this release is the title which is now translated as Electronics Squad Megaranger, as opposed to Electromagnetic Sentai Megaranger, which was actually something I just swiped from wikipedia. The other big change is the Opening and Ending songs. We decided as a group that subbing each episode in the “classic style” would be a fun, and interesting, way to do things. Basically this means that every other episode will feature the translated English lyrics, and the other episodes will feature the romaji lyrics. Kinda weird, but it’s fun. If you’ve already watched my old scrub then we’ve thrown in episode 24 just for you! Thanks to Kou, Lynxara, and Alkaid for taking on this project. I really couldn’t think of a better team of people to work with. This show has very much become a part of me. I think about it way too much, and I can’t imagine going back to those boring summer days when I knew nothing about subbing. I’ve personally talked about Megaranger’s first 20 or so episodes more times than I can count, and I’m really drawing a blank about what else to write here; so I’ll end this by saying that if I had to describe Megaranger in one word, I’d say that it’s just “MEGA”. I’ve hyped up this show like crazy and I really hope I haven’t over hyped it for you. There’s 27 episodes left so let’s all hop on our Cyber Sliders and make it a Mega ride! When I was deep enough in Sentai fandom to keep track of which shows were on the air, Megaranger was the show currently airing. They say that most people develop a special attachment to their first series in a fandom, and maybe that’s true. 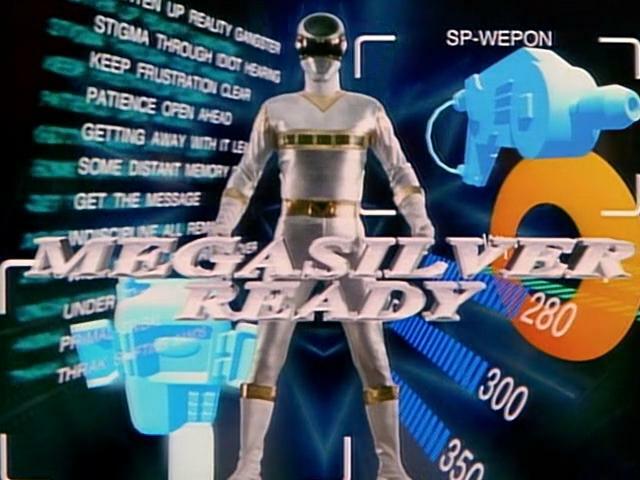 I’ve always been especially fond of Megaranger, before I even knew that there was anything noteworthy about the show. Megaranger is often described as the “video game Sentai,” and that’s true to a point. There are many video game references in Megaranger. But video games don’t encompass everything Megaranger is talking about. In a broad sense, Megaranger is a show about advancing technology, and the consumer electronics explosion that occurred in the mid-90s. For Japan, video games were a huge part of that. But so were cell phones, the earliest HDTVs, digital cameras, hand-held camcorders, and the potential of satellite-based technologies. Writing from this point in time, in the year 2013, it’s easy to take this stuff for granted. Every smartphone includes a digital camera, now, and can talk to GPS. In fact, the smartphone I own now is in every conceivable way a better computer than the pricy PC I used back in 1997. So is the smart HDTV that sits in my living room. But I also think that makes Megaranger special. In a lot of ways, Megaranger was a show about the future, but the future it looked toward wasn’t a far-off sci-fi dream, as in Timeranger. The future Megaranger looked forward to was the world we live in right now, almost 20 years later. In Megaranger, you see a dream that in many ways has come to fruition in our own time. Megaranger, in its way, is the past dreaming about the world we live in right now. Perhaps as a consequence of Megaranger, I like my Sentai to be forward-looking and optimistic. The future looked terrifying and uncertain in 1997, and many worried that the children of the day were inheriting a world that was beyond saving. Megaranger defied such cynical thinking, and showed teenagers becoming heroes who could save the world with the power of ever-advancing technology. It’s not 1997 anymore, but Megaranger’s message is still a good one, and the show is still extremely enjoyable. The characters are likable, the action is plentiful and well-done, and there’s no shortage of classic Sentai goofiness. With this release, we hope to bring Megaranger into the future that is now, for a new generation of fans to enjoy. 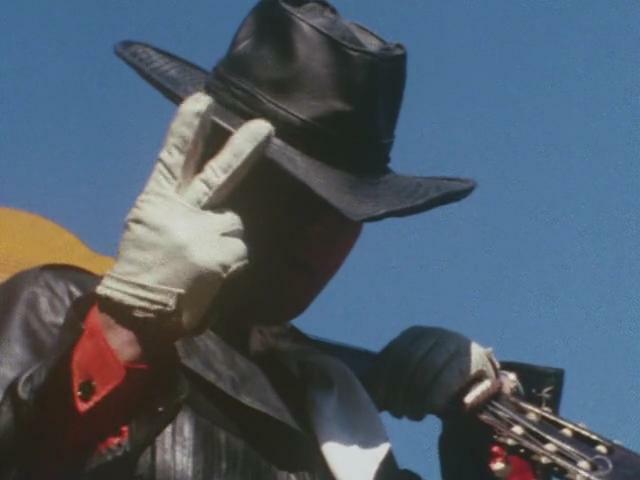 You can also look forward to seeing Sentai’s move to the morning timeslot and return to the 25 minute format not seen since Dynaman, starting with episode 8. In addition, as you watch the show, I hope you’ll spare a thought for the show’s head director, long-time Sentai veteran Nagaishi Takao, whose name you’ll see in a bit over 1/3 of the episodes released in this batch. Mr. Nagaishi passed away this year from Parkinson’s Disease, but his legacy — which spans nearly the entire existence of Tokusatsu as we know it, beginning with the original Kamen Rider in 1971 — will never be forgotten. Of course, time goes by and the original scrub by MegaAnon expanded and we now arrive at today and 24 episodes of Megaranger. 24 funny, serious, amusing and all-around great episodes of Megaranger. From the first formation of Galaxy Mega to the arrival of this ‘silvery guy’, there’s lots to watch and enjoy. This is a series not judged by just its actors, its suit actors, the music or the production team but by the whole of its parts. This is just the start…of something very MEGA indeed!